NOVEMBER 15--Baseball star Barry Bonds was indicted today on perjury and obstruction of justice charges stemming from a years-long federal probe that examined his alleged use of steroids. A copy of the Bonds indictment, which was filed today in U.S. District Court in San Francisco, can be found here. 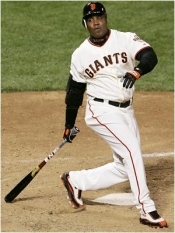 According to the five-count indictment, Bonds lied to a federal grand jury in December 2003 when asked about his use of steroids. During that appearance, Bonds, 43, repeatedly denied that his trainer, Greg Anderson, provided him with performance-enhancing drugs like human growth hormone and the illegal products distributed by the notorious Bay Area Laboratory Co-Operative. Under oath, Bonds clamed that one cream proferred by Anderson was flaxseed oil. "And I was at the ballpark, whatever, I don't care. What's lotion going to do to me? How many times have I heard that: 'This is going to rub into you and work.'" Federal prosecutors apparently will seek to prove that the purported flaxseed oil was, in fact, one of BALCO's illegal salves, which were known as "the clear" and "the cream." That charge, the indictment indicates, will apparently be buttressed by results showing that Bonds has tested positive for steroids: "During the criminal investigation, evidence was obtained including positive tests for the presence of anabolic steroids and other performance-enhancing substances for Bonds and other athletes."